KAVALIERGLASS, Co. Ltd. has been manufacturing specified volumetric gauges – volumetric flasks and butyrometers with an unlimited period of validity of verification, pursuant to Order No.345/2002/Coll. These gauges have obtained Certificates of Approval of TCM 131/97-2712 and TCM 131/97-2713 type. 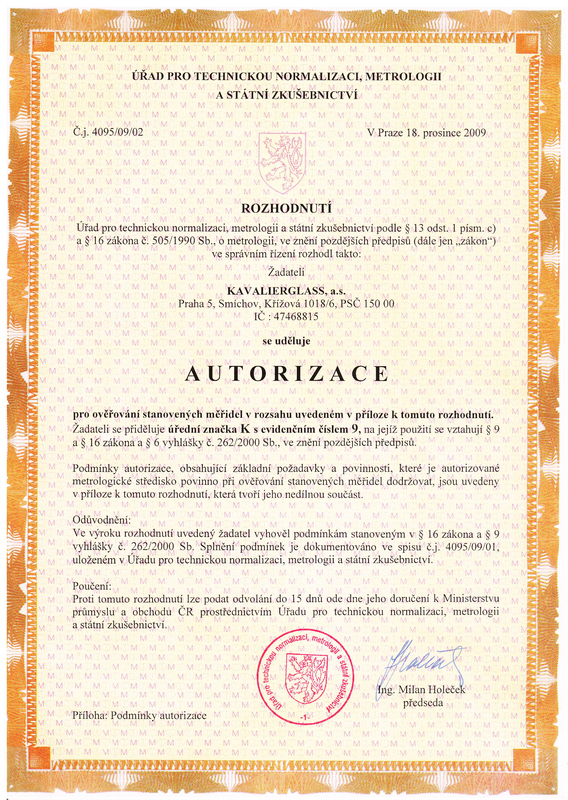 Based on the authorization granted by the Czech Office for Standards, Metrology and Testing (ÚNMZ) through Decision No.57/2000, KAVALIERGLASS, Co. Ltd. has been authorized to perform verification of these specified gauges and to mark them using assigned K verification mark with registration number 9. The Authorized Metrological Center of KAVALIERGLASS, Co. Ltd. is a holder of the certificate of metrological, technological and personal qualifications for specified gauges verification. AMC management and the staff performing verification are holders of relevant professional qualifications certificates. The AMC has issued its Quality Control Manual, the purpose of which has been to set up a system ensuring uniformity and correctness of specified gauges and their verification to the extent arising from the authorization document and terms and conditions of authorization. KAVALIERGLASS, a.s holds the quality management system certification in accordance with the international standard ISO 90001 which is well introduced and maintained. Thanks this system are provided conditions for the achievement of the conformity of products with specific requierements of our clients and relevant legislation in all stages product cycle as from marketing, demand and order management , purchase, production preparation, own production, control and packing, sale, despatch and feed back of the clients in all succesive procedures. With regards to the introduced system our intention is this system to be maintained , envolved and improved. We assure with its help permanent such quality of products and services which meet requierements of our clients and rank our company among the most successful companies producing borosilicate glass. Institut pro testování a certifikaci, a.s., accredited testing laboratory No. 1004, Zlín, Czech Republic.